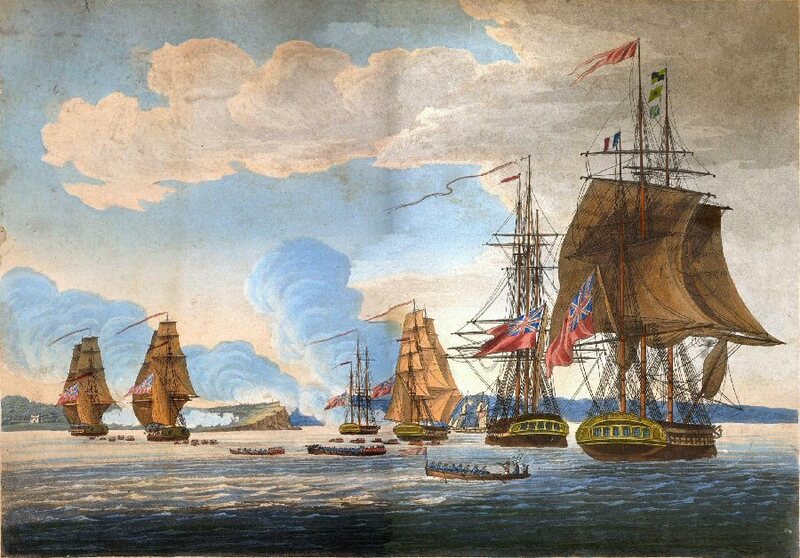 OSWEGO – The Oswego War of 1812 Symposium features a compelling series of lectures and exhibits about the war and its effects along the New York-Canadian Frontier. Come to the Lake Ontario Conference and Event Center on East First Street in Oswego for the event which runs from 9 a.m. to 5 p.m. on Saturday, April 5 and from 9 a.m. to noon on Sunday, April 6. The symposium opens on Friday, April 4 with a student presentation competition, a meet-and-greet social with cash bar, and early registration from 6 to 9 p.m.
“Attack of Fort Oswego, on Lake Ontario, North America.” May 6, 1814. Drawn by Captain Steele and engraved by R. Havell & Sons, c. 1815. Capt. Steele was a Royal Marine who participated in the attack. Image is courtesy of the Collection of Paul Lear. A dozen speakers will be at hand to discuss a variety of War of 1812 topics, including battle analysis and military archeology; amphibious warfare and soldiers; British strategy and division; flag conservancy; the war’s effect on soldiers and society; and remembering and memorializing the war. The discussion commemorates the bicentennial of that pivotal battle that nearly changed the course of the war. “Throughout the two-day battle, American troops put up a valiant defense, but succumbed to an overwhelming force of British sailors, marines and regular troops. The British, however, achieved only partial success by capturing foodstuffs, ordnance and ships stores. The Americans were able to secure essential naval supplies destined for Sackets Harbor where an American fleet was under construction, thus keeping the U.S. Navy at pace with the Royal Navy’s shipbuilding efforts and in the battle for control of Lake Ontario,” he said. Lear has served as superintendent of Oswego’s Fort Ontario State Historic Site since 1999. His previous experience includes working as a curator of education at New Windsor Cantonment, Washington’s HQ’s in Newburgh and Fort Ontario State Historic Site. Esteemed presenters from across the state and Canada will be at the fourth annual Oswego War of 1812 Symposium April 4 to 6. 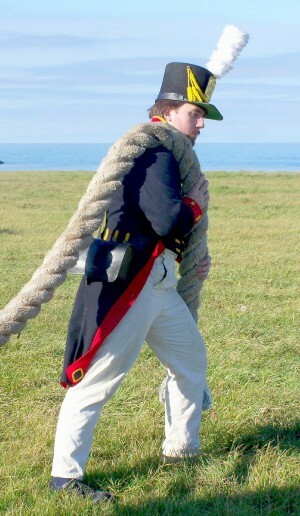 Naval historian and author Dr. Gary Gibson will talk about the struggle for control of Lake Ontario and the legend of the “Great Cable Carry.” Pictured is Fort Ontario State Historic Site’s Ian Mumpton re-enacting the event. A historical archeologist, Lear also worked for the New York State Museum’s Cultural Resource Survey and the Archeology Unit of the New York State Bureau of Historic Sites. He received a master’s in public archeology from Rensselaer Polytechnic Institute and a bachelor’s in anthropology history from SUNY Albany. He currently serves as chair of the Oswego County War of 1812 Bicentennial Committee and on the Oswego County Tourism Advisory Council. On Sunday, April 6, Dr. Gary Gibson, noted naval historian and author, also returns to the symposium with a new discussion, “Worthy of a Better Fate: the May 30, 1814 Battle of Sandy Creek.” His presentation continues the discussion about the struggle for control of Lake Ontario and highlights the actions that followed the Battle of Oswego to ensure the success of the American cause. Gibson has long been interested in naval history and has researched the War of 1812 on Lake Ontario and the St. Lawrence River for more than 20 years. He has digitized much of the primary source material collected during his research which is now available at the Sackets Harbor Battlefield State Historic Site in Sackets Harbor, N.Y. He has also presented numerous papers on the results of his research at symposia and meetings in the U.S. and Canada since 2001. A trustee and past president of the Sackets Harbor Battlefield Alliance, Inc., Gibson is also a retired computer scientist and currently resides in Sackets Harbor with his wife, Susan. The symposium is sponsored by the Friends of Fort Ontario, Sackets Harbor Battlefield Alliance, Oswego County Tourism Advisory Council, The Lake Ontario Event and Conference Center, Pathfinder Bank, SUNY Oswego Office of Business Relations, IHeartOswego, the Palladium-Times, H. Lee White Marine Museum, Man in the Moon Candies, WCNY-TV, Dot Publishing, Oswego County Today, City of Oswego, and the Oswego County Department of Community Development, Tourism and Planning. Registration for both days is $75 per person or $35 for students with a valid ID. The registration fee includes Saturday’s lunch, refreshment breaks on Saturday and Sunday and workshop materials. One-day registration is also available: $50 for Saturday, including lunch or $25 for Sunday. For students with a valid ID, one day rates are $23 for Saturday, including lunch or $12 for Sunday. SUNY Oswego students who register with Dr. Richard Weyhing in the school’s history department by March 28 will have their admission covered. Advance registration is required and may be paid by check or credit card through the Friends of Fort Ontario. Contact Lear at 315-343-4711 for credit card payments Monday through Friday, from 10 a.m. to 5 p.m.
Checks should be made payable to “Friends of Fort Ontario – 1812” and mailed to the Fort Ontario State Historic Site, 1 E. Fourth St., Oswego, N.Y. 13126. Special room rates for symposium attendees are available at the Best Western Plus Captain’s Quarters Hotel, 26 E. First St., Oswego. Please call the hotel at 315-342-4040 and mention the Oswego War of 1812 Symposium. For more visitor information, go to http://www.visitoswegocounty.com or contact the Oswego County Tourism Office at 315-349-8322.